Teamwork. Hmmm, let me think… It’s good for problem solving. Teamwork can lead to better decisions, products and/or services. It is healthy competition and can be help with motivation or to stand out of the crowd. It develops relationships. A team who work together for a long time will eventually develop a connection. This can help avoid any unnecessary conflicts. 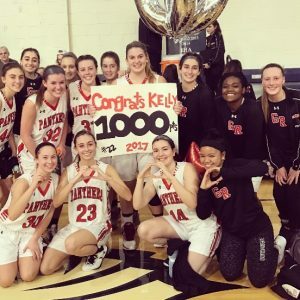 This is a photo of my niece who scored her 1000th basket during high school basketball. Although she is a natural athlete, if it wasn’t for her team, she may not have been given the opportunity for this achievement. Keeping an open mind to change can also benefit the team. Everyone has unique qualities. Sharing these qualities will allow everyone to be more productive. Working together is nothing but teamwork. Would you like to be on my team? Let’s see how well the Patriots and Cardinals work their teamwork during the Big Game on February 5th. Did your bookkeeper mess up your financials?